Today is my first day learning how to fly and I am encouraged! Last weekend I went to lunch with my mother in law to be for the first time and we ended up staying at the restaurant for 6 hours talking about everything under the sun including my messy house and how I feel like I do everything and how her son does nothing. Then I would just stop and hope he would start pitching in because it was unbearable and well that never happened. I started reading it immediately and was like I might be able to do this. It sounds doable. And as I continued to read I would laugh because I’m like this book was written specifically for me and is there really that many people out there like me that a book is on the market for us?! Well of course it’s always one excuse after another most of the time so I didn’t shine my sink right away. As a matter of fact I just kept reading this past week because I decided I would shine my sink on the weekend since I’m a payroll SHE. I was so proud of myself because I did actually do it today!!! And you are so right! It’s an amazing feeling! I even had my mom come in to see it because she was out and about and picked up an accordion file for me. LOL My mom is a BO and well that’s a whole other story. She was very impressed with my clean and shiny sink! I’ve talked to everyone in the house and have asked them to help me keep my sink clean and shiny. They kind of smirk and even said “Here we go again” but I am on a mission and yes it’s again but with your guidance it may very well be doable!! I will say that while my sink was soaking in bleach for that hour I did do 15 minutes in my kitchen and 15 minutes in my living room and although it still isn’t perfect it looks worlds better!!! I even completely cleaned off my coffee table, which is a major hot spot. Thank you for your encouragement. I like how you talk about perfectionism because I have to keep telling myself it doesn’t have to be perfect. I even stopped myself from wandering to another room while I was cleaning the kitchen. It was a conscious effort and it WORKED!! FlyLady here: I have tears rolling down my face! I am so proud of this Mother in Law (soon to be). My book Sink Reflections is not a gift book. I have said this for years. But this MILove did the right things. She knew when the time was right. When the student is ready the teacher will come. Jessica I am so proud of you for communicating your frustrations. Timing is everything. We have to hit bottom then we are ready to receive the information. 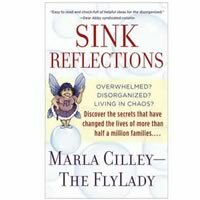 This entry was posted in testimonials and tagged flylady, get organized, Sink Reflections, TestiFLY. Bookmark the permalink.